Three L Technologies offer full Turn-key contracts on facade cladding including design, manufacturing, assembly and installation on site. We provide complete facade solutions: covers, parapets, corners, ceilings and facade elements. assembly-layout drawings and specifications for all elements. Three L Technologies engineers will optimise the design of your project – by selecting load-bearing elements based on economic criteria and their layout in accordance with existing national standards for load calculation, building location and form. A proper survey of the dimensions and configuration of the existing structure should be done in order to maximise the advantages of the modular system. To ensure adherence to quality requirements, a survey is carried out by experienced qualified staff, using equipment with the appropriate accuracy and functionality. Digital tachymeter scanners are used for irregular building surveys, resulting in a precise computer model of the existing structure. 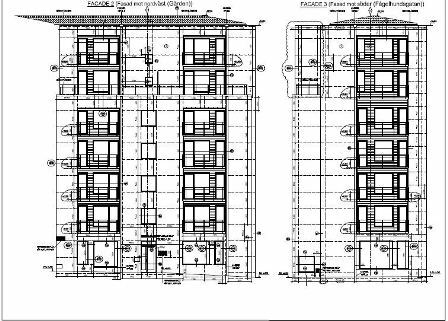 As a result of the On-Site Survey, the customer receives survey drawings, which are used to continue the system design process. “Three L Technologies” has been working in ventilated facade industry from 1994 and has deserved reputation for supplying high quality components. Our employees specialize in the designing and manufacturing of precision sheet metal components of mild, stainless steel, aluminum, aluminum composite and other materials. The potential product range has diversified along the years of gained experience and technical equipment, which can satisfy the precision our clients demand. Also product pre-assembly and other procedures can be taken into task list. Today our ventilated facade components are delivered widely across the Baltic States and Scandinavia. For more information about our manufacturing facilities, see information in Production services. Our assembly workers and site managers are qualified and trained to install ventilated facade cladding. With qualified assembly services, the customer can be assured that the assembly will be carried out strictly in accordance with the project design and all relevant technical quality criteria and standards.